Is this reason to celebrate or to worry? The BLS recently released statistics predicting job growth over the coming decade, and they point to some interesting trends. First, the really good news: the Bureau projects the overall number will grow by 10.2 percent. The bad news? That's by 2018, meaning you may to wait a while longer for the economic engine to crank out a shiny new position that was tailor made for you. 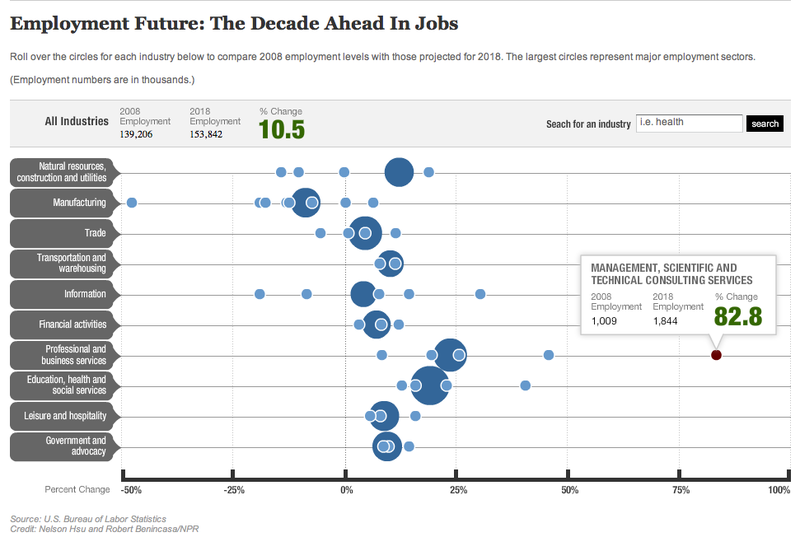 In terms of trends, the figures at the extremes of the chart tell their own story: manufacturing jobs are expected to decline by 47.9 percent from 2008 levels (the jury's still out on whether they managed that in 2009 alone), while the biggest gains will be seen in management, scientific and technical consulting services. As you can see from the graphic below (which takes you to the full interactive version on NPR, if you click it), that sector is expected to grow by some 82.8 percent from 2008 levels. Which sounds like a good thing, until you consider that a rise in consulting positions a) won't offset a fall in manufacturing and b) will probably mean there are less full-timers in management, scientific and technical positions. The one group for whom this report probably spells good news is actually the one closest to not caring about the future of the employment market: baby boomers. While the fear of that group leaving the workforce en masse and taking their wealth of experience and knowledge with them tailed off when the recession leveled their 401(k)'s, some murmurs of concern along those lines have been surfacing along with the resurgence in the stock market. But if boomers can continue to operate--possibly on a part-time or semi-retired basis--as consultants, well that changes the brain-drain scenario considerably, now, doesn't it?